Mad Mats Mad PARTY Mats - Carefree, convenient, and classic party mats fold up into a neat 10x20 inch packet weighing only 1.4 lbs. Carefully sewn polyester ribbon joins three sections and ties the mat securely, with convenient handles for easy transport. 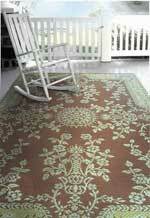 The flat weaves and soft tubular threads don't absorb dirt or stains of any kind. When they get soiled they can be simply rinsed away with a garden hose! Perfect for your outdoor adventures! 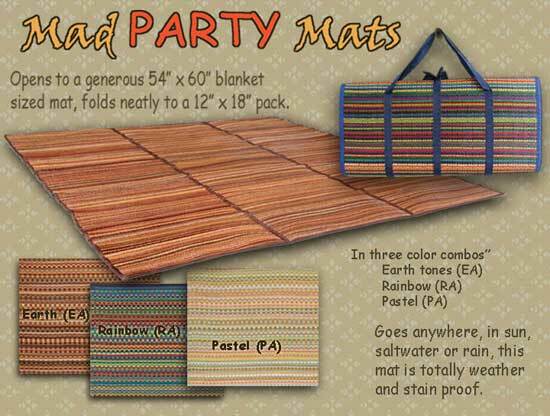 Currently the party mats only comes in the Mix Designs three colors.